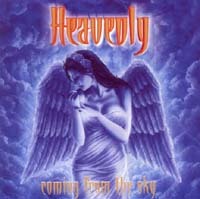 First time I was introduced to Heavenly in 2001 when I visited a concert of Silent Force where Heavenly supported them. Later I bought the album Dust To Dust straight after the release and I was fascinated. Unfortunatly I missed the Virus album, but now I hold Carpe Diem in my 'virtual' hands. While listening to it the first time I recognized that they used a bit more choires. They also pushed up the melodic tunes in their songs. So if you pick the title track Carpe Diem, you will listen to an short intro and then introduced to heavy riffs which are turning into the known melodic style of Heavenly and you are forced to move you head synchron to the music. Ben Sotto's  voice is in top form again. And mighty choir-chorus with great riffings crowns the track! Well done (but if I'm honest – the chorus reminds me a little bit on Ministry Of Saints by Edguy). Lost In Your Eyes could be a single release. It does groove very well and I am sure that it will find it's way to your ear, too. Farewell is a 'metalized' Queen song. It is not a cover, but the arrangement, the voicings and everything else could be written by Queen (well done!). Full Moon has the great chorusses - like I know them. Great, fast riffings and big choires. And again, A Better Me could be from Queen, too. I must say that I like the voice of Ben Sotto. It is very clear and he knows how to use it right. Ashen Paradise starts with epic choires, symphonic arrangements and church organs and later it does turn into a fast, melodic metal song. Very nice! The Face Of Truth is more straight, has less choires, but nice, too. Ode To Joy is well known and now you can listen to a fast melodic metal version of it. Very powerful! Ben's voice does remind me a little bit of Michael Kiske at this tune... The last track Save Our Souls gathers the rest useable power of Heavenly at this release and produces a very cool tune with all elements of their sound! If you know them, you'll listen to it. If you don't know them, give them a chance! Listen to: Carpe Diem, Lost In Your Eyes, Farewell, Ashen Paradise, The Face Of Truth and Ode To Joy. 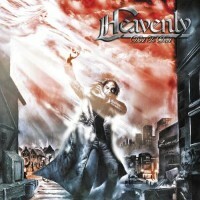 The French band Heavenly is back with Carpe Diem, their 5th album and this time it took a bit longer. Virus was released in 2006, but musically the band didn't change. The French still offer some power metal tunes with symphonic elements. The opener Carpe Diem has a intro part before going full force. An epic, heavy riff-based tune which has some surprises like different vocal styles, but somehow the song make me think of Edguy... With Lost In Your Eyes they change a bit, become more epic... The song has a slight Queen-ish touch... And the following Farewell shows this influence even more. Sure, Ben Sotto can't keep up with Freddie Mercury, but they combine some Queen-esque elements with their symphonic power metal. Well done. With Full Moon they present a track which shows their roots, but also some new elements. At Ashen Paradise Mr. Sotto's admiration for Michael Kiske - and the old Helloween - shows through, but spiced up with some symphonic elements and big choirs. A little special is the melodic speed metal version of Ode To Joy, nothing quite new, but fun. And with the catchy Save Our Souls they finish the album. Fans of Heavenly won't be disappointed by Carpe Diem and the ones who think they are just another Helloween clone, should give this album a try! Check out: Lost In Your Eyes, Farewell, Full Moon and Ashen Paradise. In the past record label gave young bands more time to develop then these days. The unwritten rule was about the 3rd release - make it or break it. This is the 3rd album of the French quintet and time to stop their critics who call them Helloween copycats. Their latest piece of work is a conceptual album called Dust To Dust. The band of singer Ben Sotto tells the story of a man who became a vampire, after centuries he reflects on what happened during his life time in the world. That forced him to search for the vampire who bit him, to get turned into a human again. Divided into three chapters the songs present the beginning (first chapter) and the end of the vampire (last chapter). The 2nd chapter is more a reflection on the change of the world, of wars and how careless mankind is treating the Earth. The story dictates the musical direction and a larger variety of feelings. In the past Heavenly played mainly happy songs, now they are dark and gloomy. Ashes To Ashes... is an intro where you hear steps in a small alley - it sounds that way - on a windy night, voices, dogs barking, noises, then the foot steps fall faster... Then a few spoken words and mystic sounds lead you into the album. The opener could be taken from a movie soundtrack. The first song is Evil. Musically they present here melodic speed metal which still reminds of Helloween - at Hansen-era and at the Kiske-era. On the other hand there are reminiscences of Angra and Stratovarius. Singer Ben shows a larger variety in the vocal parts and huge choirs add a bombastic touch to the song. Breaks lead into mid-tempo parts. Evil shows that the French five-piece learnt from the critics and have now discovered their own musical way. A good song to get an idea of the new Heavenly sound, coz it has all the elements. Staccato guitar riffing leads into Lust For Life which again use choirs as a counterpart of the fast guitar riffing. On this one Ben Sotto's vocals remind me of Michael Kiske and of André Matos, but it seems that he's developing his own style upon the ones who influenced him mainly. Perhaps it was healthy for the French that the line-up changed during the last years. After the debut album was released bassist Pierre-Emmanuel Pelisson and guitarist Frederic Leclercq joint. Before the band entered the studio for the recordings of Sign Of The Winner guitarist Chris Savourey left and got later replaced by Charley Corbiaux. I think that this line-up changes were necessary for the band to find their own musical way. On Illusions Part 2 (The Call Of The Wild) Ben add some rougher, meaner vocals which build a contrast to the bombastic choirs. Parts of the song could have been taken from Keeper Of The Seven Keys albums, but well.... Still Helloween is a big influence, but it wouldn't be fair to call them copycats these days. Hopefully the French will continue with this development. These days it ain't easy to develop something completely new and to be honest I prefer to listen to a band like Heavenly then to listen to Helloween these days, but that's just my personal opinion! Fans of Helloween, Gamma Ray, Angra, Stratovarius, Edguy and similar bands should check them out! On the second release Sign Of The Winner the French band Heavenly is presenting - like on their debut Coming From The Sky - well established sounds. In my opinion the youngsters stick too much to the sound of their idols which are obviously Stratovarius, Gamma Ray and Helloween and lack their own sound. Sure, songs like Destiny, Condemned To Die and The Sandman are good, powerful songs which are sound-wise got the final touch by producer Tommy Hansen, but they don't have the class of genre releases like Gamma Ray and Edguy who released their albums at the same time. So please guys, next time a little more of your own identity! 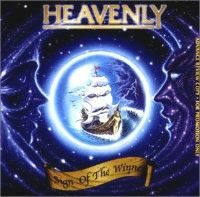 And no one can blame the label that they signed a band which sounds like old Helloween or Gamma Ray, the fans voted for Heavenly! So, this is what the fans wanted and they got what they voted for! That's democracy! It the fans vote! Noise presented some newcomer bands on their website anonymously and the fans could vote. The winner of this vote are Heavenly - even if I first thought it's something new of Helloween... But listening a bit more carefully revealed that it ain't the Hanseatic. Even if singer Benjamin Sotto sounds partly like Michael Kiske musically they are close to Helloween, too. Perhaps it's Piet Sielck's production... Catchy songs like Number One, Time Machine and Riding Through Hell are sneak into your brain and just stay. And the other tracks are far from bad. Btw, at Time Machine Kai Hansen joined them. Gammaween – Hellosavior –Iron Ray? No, it's Heavenly!